Shipston-on-Stour have been promoted to Midlands Two West South. The Rams won 47-26 at Coventry Welsh on Saturday and cannot be caught by third place Old Leamingtonians, who slipped up at Manor Park with only one Midlands Three West South game remaining. After last weekend’s slip up the Rams knew that they needed a victory to keep their chances of promotion alive and they set about it with some excellent rugby in the first half. Shipston got into their stride early on, playing with real speed from the breakdown and moving the big Coventry forwards around the park. The front five were dominating the scrum for the Rams and this gave them real momentum to take control of possession and utilise the pace they have out wide to good effect. Henry Hobill cut inside and off-loaded to fullback Ed Cowper, who stepped a couple of defenders on the inside and raced under the posts for the opening try. The Rams soon doubled their lead when the ball was spun wide through the hands to Hobill. With plenty left to do, he raced towards the line and managed to bundle his way over with three defenders for company for his first try for the club and Rob James converted both scores. Coventry came roaring back at Shipston and managed to grab a try of their own following some pressure in the 22. With the half drawing to a close, the Rams upped the tempo and span the ball out to the left from an attacking scrum. Tom Corby linked well with his centre partner Harry Jackson who out-sprinted the covering defence to the try line and James gave the Rams a 21-7 interval lead. Shipston secured the bonus point when Alex Hammond reclaimed the ball from kick-off and, after several good phases with Charlie Hollies-Everett and Ben Summers making good carries deep, the ball was recycled quickly to Matt Corby who broke through the first tackle and made his way to the try line. Corby found the supporting George Minogue who helped his captain over the line for the try and James added the extras. A fifth try followed a good line-out win when Will Hammond got the ball away quickly and James gave a short pop to Thomas Page, who hit the line at pace and touched down under the posts. 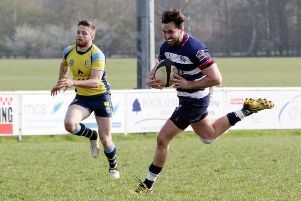 Shipston scored another brace of tries before the hour mark before Coventry used their big forwards effectively and scored a three tries to clinch a deserved bonus point.